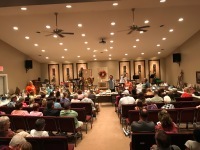 Grace Fellowship Church of Greeneville, TN. - You have just launched Grace Forward! - Greeneville, TN. The Gospel is still Good News. At Grace Fellowship we rejoice in proclaiming the life of Jesus Christ, his death upon the cross and his glorious resurrection from the dead. NEW ! Click the play bars below for Pastor Jim's most recent messages at Grace Fellowship. Anger Management March, 10th 2019 - Jim Bunch Sr. Excuses for Bad Behavior - part 4 - by Jim Bunch Sr. Excuses for Bad Behavior - Part 5 - by Jim Bunch Sr. Excuses for Bad Behavior - part 6 - by Jim Bunch Sr. Excuses for Bad Behavior - part 7 - by Jim Bunch Sr.
Click here for more Podcasts by Jim Bunch Sr.